If I had access to some big data at Veeam I am confident that the numbers would state that most people that have bought and use Veeam Backup & Replication for the Backup and maybe secondly replication function, or maybe they don’t use the replication function at all. I want to give some airtime to that replication side of the house, I would have thought it’s got a bit more attention over the last few months because of the CDP (Continuous Data Protection) feature that will be coming in a future version of Veeam Backup & Replication extending those replication capabilities to achieve a second to minute Recovery Point Objective (RPO) whilst still having the ability with the already existing replication engine to provide application consistent image level replicas at your secondary data centre or your service provider data centre. On the 5th December was the virtual VeeamON event where I spoke very briefly about how the new CDP feature looks and feels but for this post I want to go back to what we already have available to us, and if this sways the decision for someone to pick it up and start achieving more within their business, then it’s worth the time. The first thing we need to understand is what is replication, if you are here I guess you already know, but replication is about moving data from one site or infrastructure to another. To go just a little deeper on that it’s about getting the same data blocks over to a different location so that if something was to happen at the first site then the copied or replicated blocks could then take over. Next up is understanding what type of data replication is required by your business and possibly what is achievable for the infrastructure you have. Let get into the different types available. “we cannot afford any loss of data if we were to invoke a disaster recovery plan” Ok so if this what you have been told as a consultant as an administrator then this is the first and most powerful type of replication. Synchronous Replication, Synchronous replication ensures all data written in the source storage is also at the same time written in the target storage, and waits for acknowledgement from both storage arrays before completing the operation. A possible downside to this would be this requires matching storage at both the source and target destinations with fibre channel latencies to reduce the performance overhead of the link between the storage arrays. This option is always going to be at the storage layer due to the performance impact potential, you won’t find any virtual appliance offering this, if there is please let me know but I expect they will be offering near-synchronous replication which I will touch on later. This is where I have had most my conversations regarding replication, it’s the cheapest and you can still achieve a pretty good recovery point objective. Asynchronous replication does not write data to both source and target destinations at the same time. It will leverage snapshots (this could be virtualisation snapshots as well as storage snapshots) this snapshot acts as a point in time copy of the data, this data is then sent to the target destination based on a schedule. Now normally this would be based on hours or days from a scheduling point of view but this will depend on the environment, snapshots especially virtualisation (VMware) can impact performance if they are constantly being taken throughout the day and it depends on the source storage that’s got to be able to withstand this additional operation. 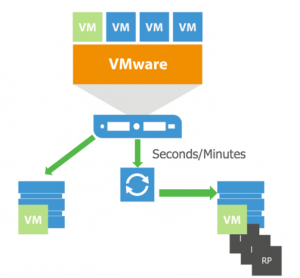 This type of replication is what Veeam uses today to transfer virtual machines from source to target allowing for minutes / hours’ recovery point objectives. We now enter the world in between Synchronous and A-Synchronous and that’s clearly going to be called Near-Synchronous Replication. This is generally going to be a policy based engine and most likely software based rather than the hardware based mentions of synchronous replication. A policy is going to be always running unlike a job that will start and stop on a schedule. The policy will be constantly replicating the changed data blocks to the target destination. This will allow for a second to minute RPO. The key benefit here is that it doesn’t use snapshots. It also doesn’t need to wait for an acknowledgement from the target destination when sending the changes over. The caveat here is that you will need some level hardware to achieve this, most importantly this would be the networking links between source and target. 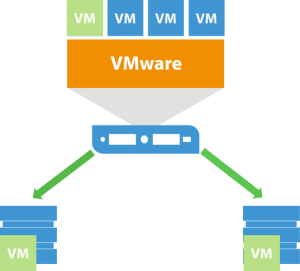 This is the category that the Veeam CDP feature would fall into and I will touch on later in this series on how this looks from an architecture point of view. Hopefully that’s given you a good overview of replication and the options available. 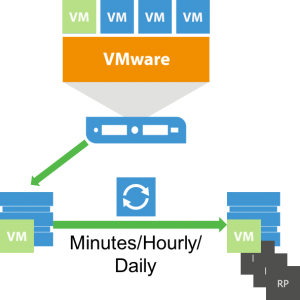 I will be back soon with some more detail on the Veeam replication workflow, also how Veeam can leverage some of their alliances storage integrations to maybe get the best of both worlds.